Basically what I’m trying to say is that I’m trying to do my part even in kinda weird, hectic circumstances. Lest you think I’m doing this out of a Mom-guilt obligation or some incessant need to Keep Up With The Jones’, let me assure you that these efforts are almost 100% selfish; I just really love Christmas, okay? 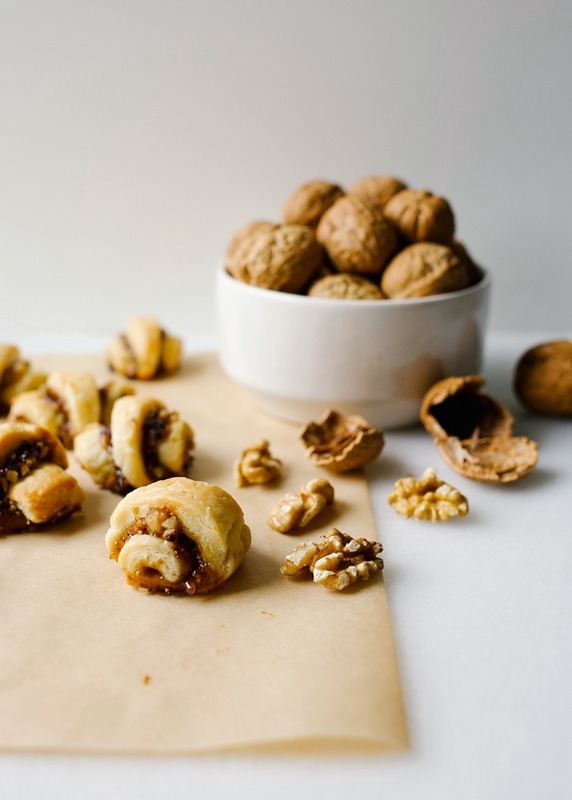 So while we wax poetic about the Baby Jesus and drink lukewarm, child-safe cocoa out of plastic cups, let me introduce you to a holiday treat that I think you’re really going to like: sweet and savory rugelach. I’m new to the ruglech train. I’ve tried to make it in the past a number of times, usually without any success, but this was the first time that I was super happy with the results. One dough with two fillings- a sweet and savory- to make a treat that is suitable for appetizer snacks or end-of-dinner desserts. I’m sharing today’s recipes with my BFFs at Diamond of California, who are my go-to for all things nuts. 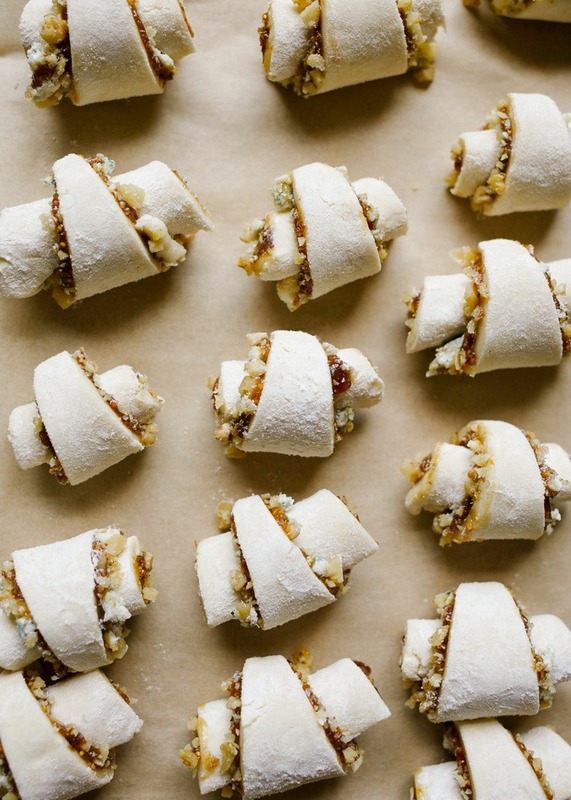 I used their marcona almonds with white chocolate for the sweet rugelach and their whole walnuts for a blue cheese and fig spread savory option. Both are divine, so if you’re in the holiday spirit, break out your nutcrackers and let’s dive in! Here’s what I know about rugelach: it’s a moist dough traditionally made mainly with flour, butter, and cream cheese. The filling options here are endless, but they’re almost always rolled into bitty spiral cookies that are baked until almost crisp. In the past, I’ve had trouble getting my dough to hold its shape in the oven and have ended up with flat, sad-looking crescent roll things. With a smidge more flour and more time to chill the dough, I found that the treats hold up pretty well in the oven. You can swap out your fillings here as you please, just be sure that you keep your dough the same. Don’t use too much moist filling or too many dry ingredients in the centers, or you may find yourself with a mess on your hands. Swapping out nuts or chocolate varieties is totally fine here- experiment! 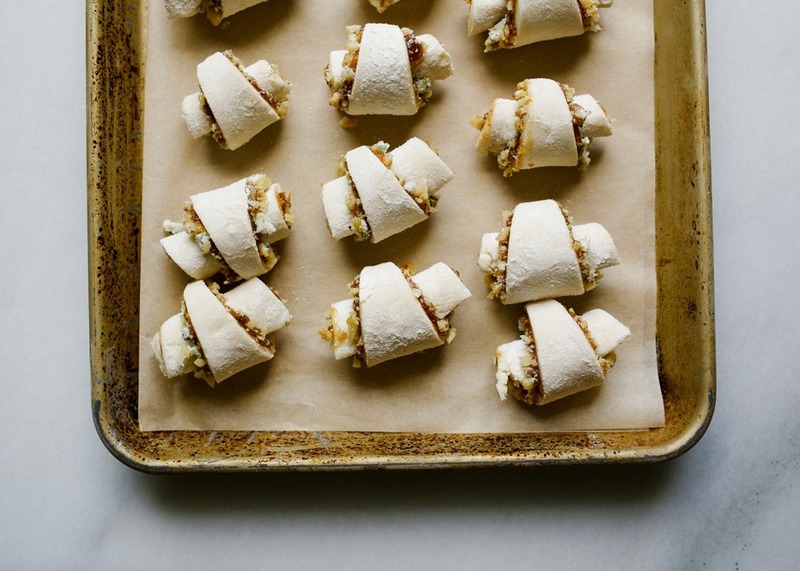 A few notes: the sweet rugelach tends to ooze it’s buttery-sugar filling during the baking process. I noticed that even a change in pans yielded slightly different outcomes. If you notice that your cookies are baking in a pool of butter about halfway through, carefully remove the pan from the oven and drain off any excess. Make sure they’re far enough in the baking process that they’ll stay put on the pan, or you may end up dumping your treats down the drain! If you don’t want to risk it- no problem. I just like this for keeping the bottoms as crisp as the tops. Keeping your dough cold and your oven the right temp as the pans go in will help to prevent some of this as well. 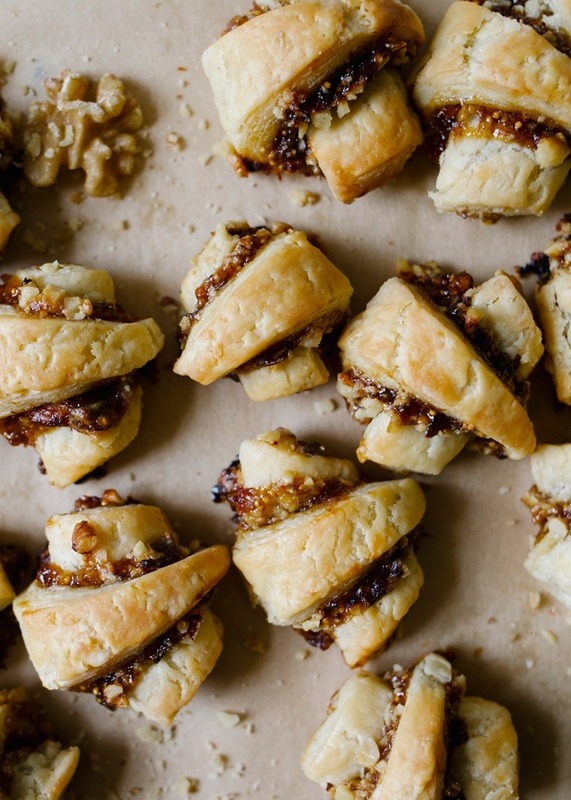 As for the savory rugelach, if you’re not a fan of blue cheese, feel free to try gorgonzola, feta, or whatever! I love how the salty blue cheese balances with the sweet fig spread, but to each his own. 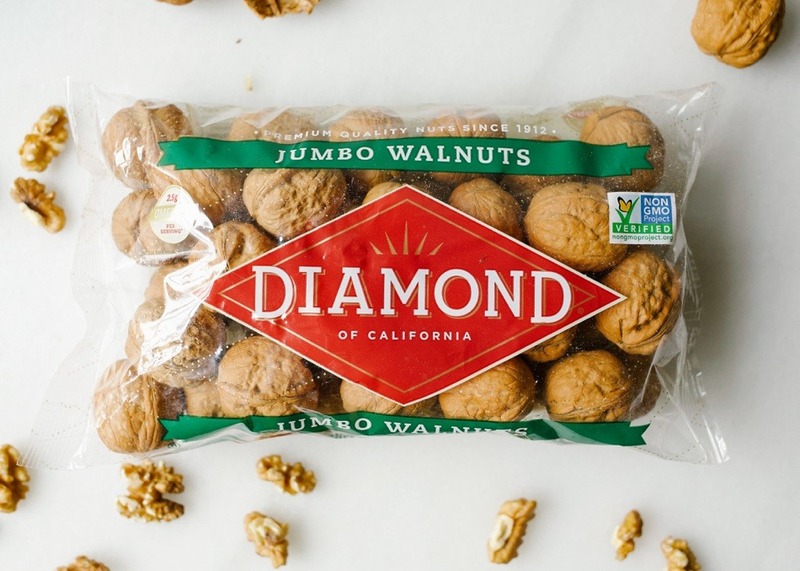 One final plug for Diamond of California: their nuts are the bomb. You can expect consistent, excellent product from them every time. Pick up a few bags at the store and give them a try yourself! The Whole Walnuts are perfect for this time of year when we all have our nutcrackers out already. They make a great addition to our desserts, bellies, and even table centerpieces, so jump on this train ASAP. As always, thank you for supporting brands that make this site possible. Merry Christmas, ya filthy animals and Happy Baking! 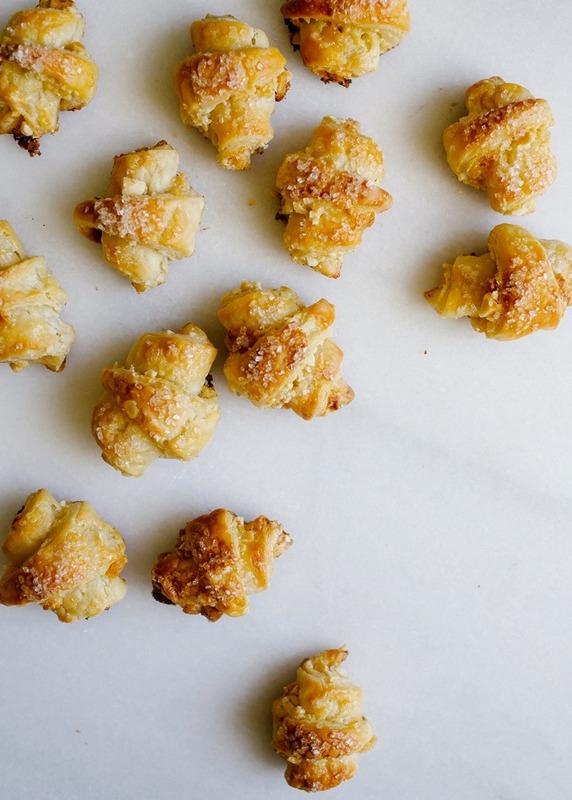 One dough creates two cookies- a sweet and savory rugelach. Switch up the filling options to create the treat of your choice. Perfect for the holidays! Pulse the flour and salt in a food processor to combine. Add the butter, cream cheese, and sour cream and pulse, pulse, pulse the mixture until a dough comes together. Don’t overwork it. Pat the dough out on a lightly floured surface into a flat round disk. Wrap in plastic wrap and refrigerate until well-set, a couple of hours or even overnight. When ready to assemble, roll your disk out onto a lightly floured surface into a round circle, about 1/8-1/4” thick. 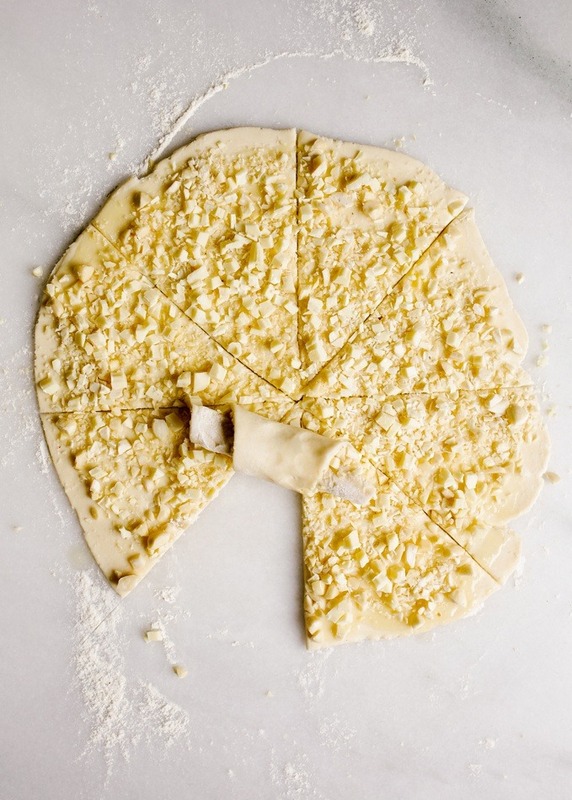 Make sure your dough isn’t sticking to your surface before you add your filling! 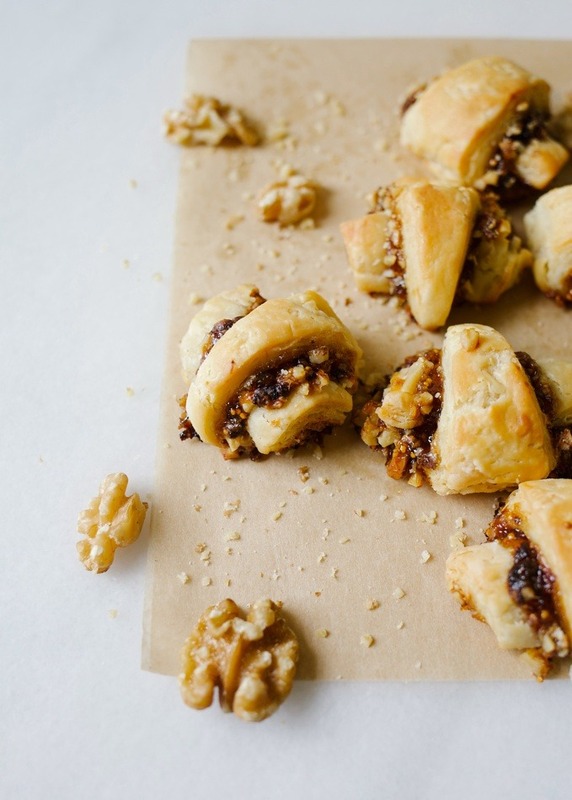 For the savory rugelach, spread the fig spread all over the entirety of the dough circle and then sprinkle on the blue cheese and walnuts. For the sweet rugelach, use a pastry brush to paint on the butter and then evenly sprinkle on the white chocolate and almonds. Use a sharp chef’s knife or a pizza cutter to cut the circle into 16 equal-sized wedges. The fat end of each wedge will be about 1” thick. Starting with the wide end, tightly roll up the rugelach until they’re little spiral dough pieces and place each one on a small parchment lined baking sheet, about 2 inches apart. Be sure your wedges are tightly rolled so that the rugelach don’t come unrolled in the oven. Place the pan in the freezer for 20 minutes or the fridge for an hour to chill. When ready to bake, preheat the oven to 350 degrees. Remove from the fridge and brush the whisked egg all over each pastry. Sprinkle sugar on the white chocolate pastries. Bake in the preheated oven about 30 minutes, or until the pastries are golden brown. Remove from oven and allow to cool some before serving. This post is sponsored by Diamond of California. Dough recipe adapted from King Arthur Flour. How long do you think these will keep? I need to take an appetizer to an out of town party. Do you think I could make them on a Thursday and serve on a Saturday? I don’t think they would taste great after than long. The pastry flakes and almost crunches on day of and day after baking, but it might be kinda blah on day 3.
hooray! I hope you will! I’m obsessed with the idea of a Minnesota Christmas. ALL THAT SNOW! WOW these look so delicious! I love rugelach cookies! Ha! I would not want to be you right now, but as usual you are doing it all with flair……..the Rugelach is a bomb alright! I’ll try it for sure. My Daughter’s FAV cookie, only chocolate. Savory for me! Thank you Kate for helping us with recipe’s that you make look easy breezy. Thank you!! I can’t wait to see what you create!